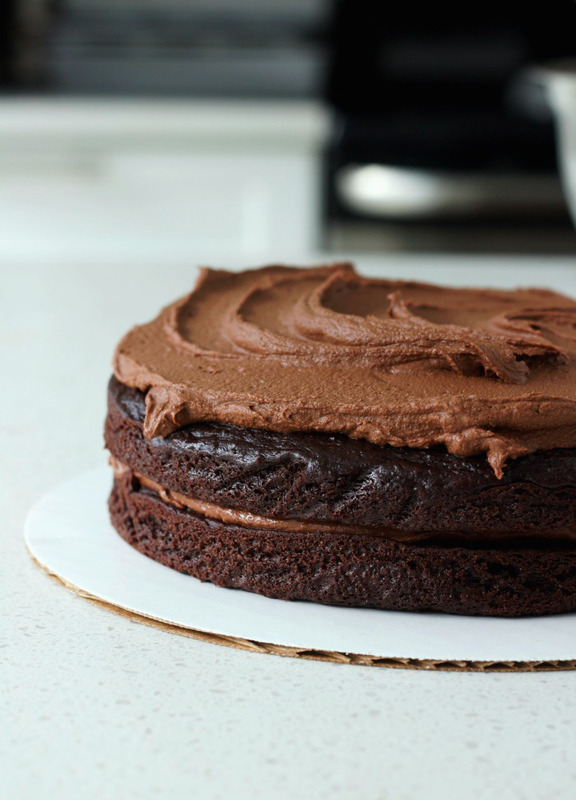 A chocolate cake made without flour, that is as light and fluffy yet dense and chocolate-y as a regular cake. It’s true. 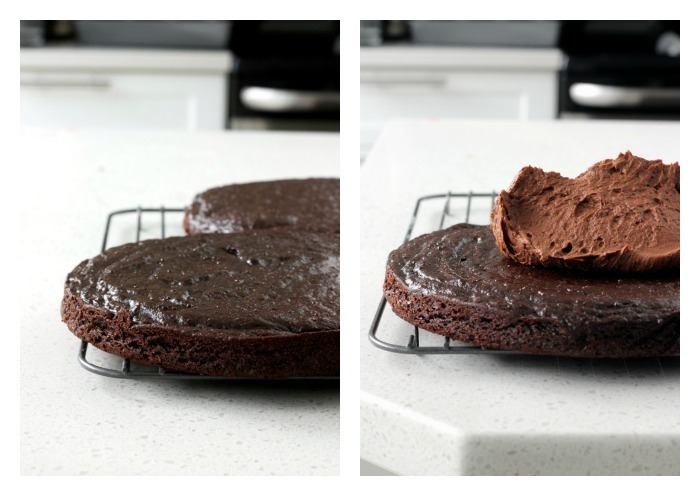 This is one of the best-ever flourless gluten/wheat free chocolate cakes I’ve made. I seldom make ‘cakes’ anymore, usually cupcakes. However, one night last week we went to visit a friend who was leaving for Europe and I wanted to bring a fancy after-dinner chocolate cake. There’s just something about a good layer cake that makes a good meal great. 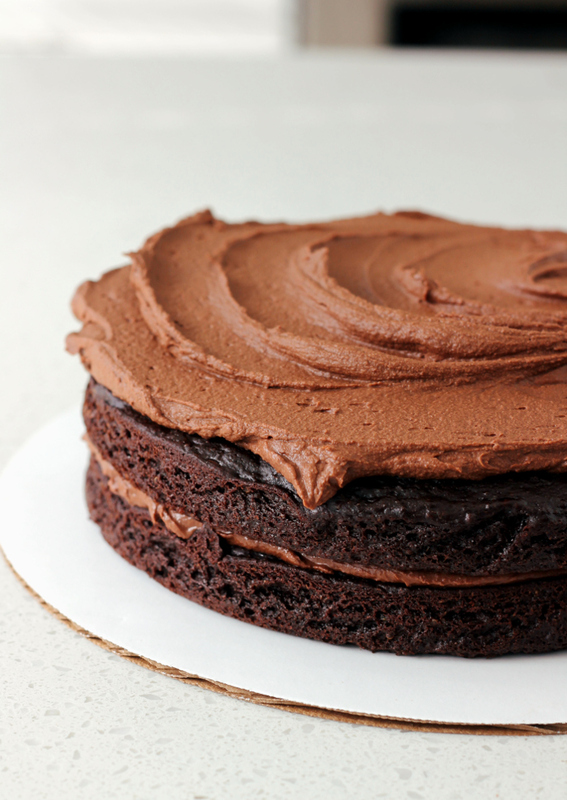 That slice of chocolate, fudge-like cake with billowing chocolate frosting completes any meal. If I were a kid, I would have eaten this with a scoop of vanilla ice-cream like I was at a birthday party. You can’t beat a slice of cake and a scoop of ice-cream. They’re iconic to any childhood. 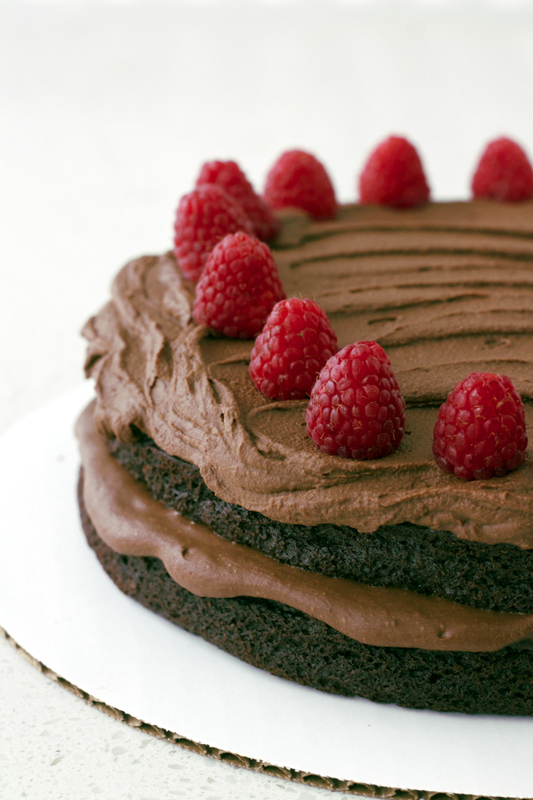 Being adults, we can have our gluten-free cake and eat it too, whenever we want. With this cake you don’t have to wait for any fancy occasion or birthday, a regular thursday night dinner will do. The best part is you can actually make it while you make dinner, because the main ingredient is Quinoa. Yes, quinoa. As in not quinoa flour, rather regular ol’ quinoa cooked on the stovetop then added to the mix. The cooked quinoa makes the cake super moist. If I hadn’t told anyone there was quinoa in it, i’m sure they wouldn’t have been able to guess. Although next time I’ll cook the quinoa a little longer to make it even more soft. In a food processor or blender, combine the eggs, almond milk and vanilla extract and blend for to combine. Add the cooked quinoa along with the melted and cooled butter and coconut oil. Blend until completely smooth, about a minute. Add the dry ingredients to the blender/food processor and pulse until completely mixed. Use a spatula to scrape down the sides. Divide the batter between the two pans and bake for about 30 minutes. Remove the cakes from the oven and allow to cool. To make Frosting: Melt the chopped chocolate + a tablespoon of coconut cream in small pot on low, stirring until melted completely. Take the chilled bowl from the freezer, and whip remaining coconut cream with hand-held blender or in stand-up mixer with whisk attachment. Once the chocolate is melted, add it into the coconut cream and continue to whip. 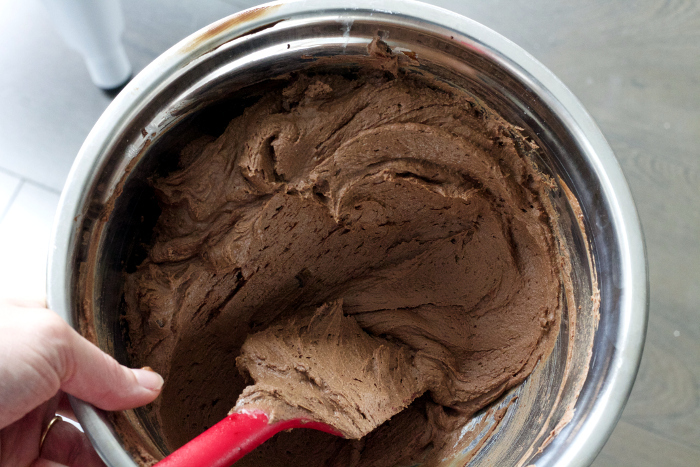 It will firm up and become a coconuts-chocolate ganache like frosting. 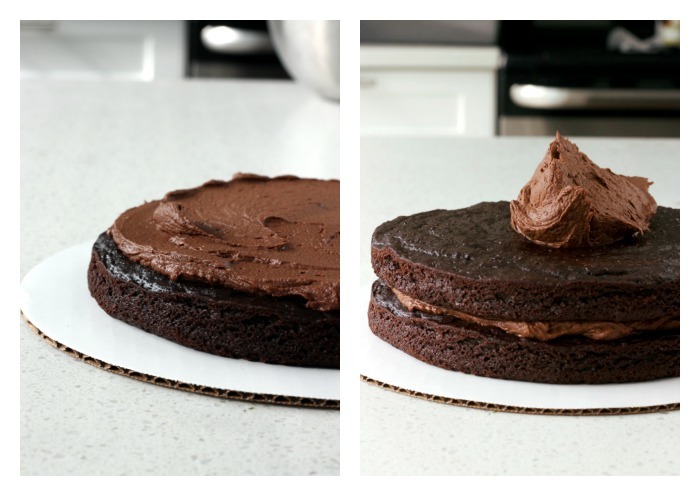 Transfer one of the cake layer to cake stand or plate, and scoop frosting onto middle. Using an offset spatula spread frosting over the first later. Place second cake layer on top, and add remaining frosting to top of cake, using spatula to spread it evenly. You can frost the sides, but I like a ‘naked’ cake, where the sides aren’t frosted. You can add berries, chocolate shavings or anything you like to the top if you like. If you aren’t going to eat it right away, I would suggest covering it an placing in the fridge until ready to serve. Take it out about 5-10 minutes before cutting. If it’s not hot out, it will be fine on the counter.